Along with the usual A-K-Q-J-10-9 symbols, Wishing You Fortune's reels are filled with bonsai trees, frogs, koi carp, dragons and lucky cards. The dragon symbol is Wild and can enhance wins significantly, especially when combined with free spins because the Wilds will be worth up to 30x (more on this in the feature section). The 'Wishing you Fortune' symbol, which is also Wild, occurs on the third reel and is significant. When this symbol appears it will activate a separate single horizonal reel above the main reels. Most symbols on this reel are Wilds, but there is the occasional Fortune symbol. You choose to stop this reel and it slows down like a 'wheel of fortune', stopping on either a Wild (more often than not) or, on the rare spin, a Fortune symbol. The Wild symbol will add between 1-5 Wilds to the reels 2-5. The Fortune symbol is different, triggering a 'mini bonus wheel' and giving you a chance to win either the Mini, Minor, Major, Grand or Mega Prize displayed throughout the game in the top right hand corner. The amounts that can be won in the bonus wheel are fixed prizes and will not increase or decrease when playing the slot. However the amounts you can win will go up when you play higher bets. Also worth noting, the higher you bet in the base game the more Fortune symbols will occur on the bonus wheel when triggered, so the chances of hitting the progressive mini jackpot wheel go up. 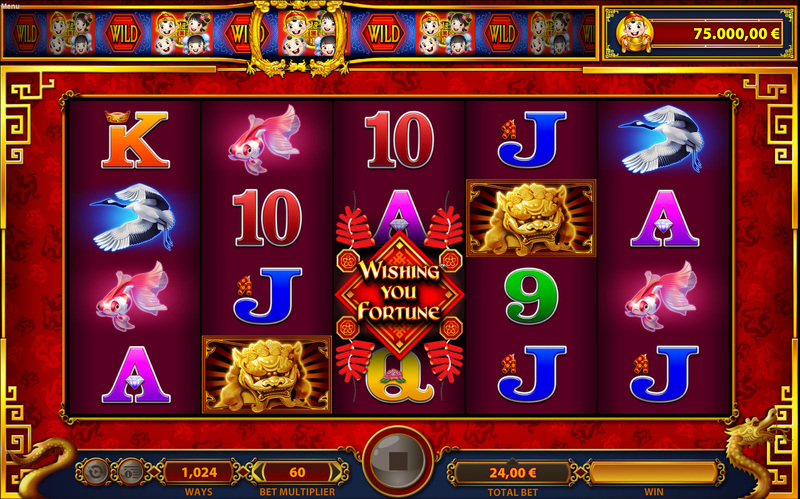 The free spins bonus feature in Wishing You Fortune is triggered by hitting 3 or more consecutive scatters from the leftmost reel. You can then pick from a choice of free spins options. If you like plenty of free spins with lower multipliers on the Wild wins then you may opt for 20-25 free spins. However you might want to choose a lesser amount of free spins but with a chance of multiplying your wins up to 30x, which is only available with the 10 free spins selection. There is an in-bonus feature, involving the red card symbol. Land a red card on reels 1 & 5 in the same spin during the free spins and win an extra cash prize of up to 50x your bet. The free spins feature has a bonus guarantee, which means you will be rewarded with a 10x stake if your free spin wins are under this level. 3 scatters: 5x stake & free spins. 4 scatters: 10x stake & free spins. 5 scatters: 50x stake & free spins. 25 free spins with 2x, 3x or 5x WILD wins. 20 free spins with 3x, 5x or 8x WILD wins. 15 free spins with 5x, 8x or 10x WILD wins. 13 free spins with 8x, 10x or 15x WILD wins. 10 free spins with 10x, 15x or 30x WILD wins. Bonus Wheel – Triggered by hitting the “Wishing you Fortune” symbol on reel 3. 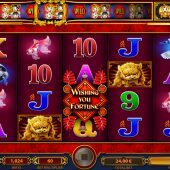 In my opinion WMS has delivered a very entertaining slot with Wishing You Fortune, which is fast becoming one of my preferred Oriential-themed slots. The soft color palette and tranquil sounds makes this game a pleasant experience and suitable for long playing sessions. The sound track and noises are certainly less abrasive than games like Aristocrat's 5 Dragons or Play'n Go's Golden Legend. Wishing You Fortune has an advertised RTP of 96% and I would say it is on the high side of medium when it comes to volatility. Considering it has a progressive jackpot, this makes this slot well worth a play and I could see myself returning to it again and again.